Faculty Advisor – Lawrence Lenhart’s first collection of essays is The Well-Stocked and Gilded Cage (Outpost19). His work has been published in Conjunctions, Fourth Genre, Passages North, and Prairie Schooner. Lenhart teaches fiction and creative nonfiction at Northern Arizona University and is the reviews editor of DIAGRAM. Editor-in-Chief – Weldon Ryckman is working on his MFA, troubleshooting GIS, and wondering about invasive species. Nonfiction editor – Jamie Shrewsbury is originally from Baltimore, but she loves her new home in Flagstaff. She is currently working on her MFA in creative writing at NAU while teaching English and taming a toddler. She can’t resist taking photos of neon signs. Fiction Editor – Addyson Santese is a creative writing student in the MFA program at Northern Arizona University. She enjoys hiking, camping, and nature photography, and often returns home to Colorado. 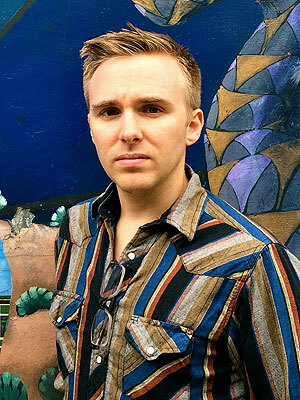 Fiction Editor – Nick Carassanesi is currently studying for an MFA in Creative Writing at Northern Arizona University. He enjoys contemplating the human condition and is a fan of Science Fiction and World History. He hails from Maryland, where he learned to admire the awe inspiring size of the ocean. Poetry Editor – Margarita Cruz is currently pursuing her MFA in Creative Writing at Northern Arizona University. You can find her work in The Tunnels. She works for the only independent bookstore in Flagstaff, Arizona. She’s a little obsessed with coincidences. Web Editor, Visual Arts Editor – Mark Alvarez once made the president of Chanel laugh while wearing a shirt with a corpse on it. This pretty much sums up his life.